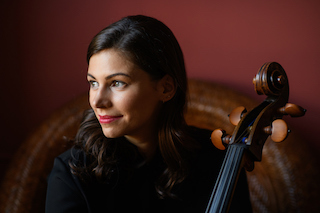 A sought-after musician throughout the New York scene, cellist Caitlin Sullivan can be found equally on the stages of Lincoln Center and Carnegie Hall, and at unconventional spaces like clubs, art galleries, or even a double-decker bus. Recognized as having the “understanding and emotional projection of a true artist” by the New York Concert Review, Ms. Sullivan has designed a multi-dimensional career as a performer of both classical and contemporary music. In addition, Ms. Sullivan has a strong passion for music education and advocacy, frequently performing in schools and community venues, and working with aspiring music students around the world. Having formidable performance experience with a variety of groups, Ms. Sullivan is a longtime member of several celebrated New York ensembles including The Knights, Decoda, and IRIS Orchestra in Memphis, TN. She is also an active substitute cellist with the New York Philharmonic, performing often during their season. Ms. Sullivan has made numerous appearances with other ensembles including Wordless Music Orchestra, Ensemble Signal, Princeton Symphony Orchestra, as well as Boston-based chamber orchestra A Far Cry. Additional ensemble experience includes Ms. Sullivan’s membership with Ensemble ACJW (now Ensemble Connect), which enabled her to perform chamber music regularly as part of a Carnegie Hall subscription series in 2007-2009. A central focus of Ms. Sullivan’s work is Decoda - the first-ever affiliate ensemble of Carnegie Hall and one of the most enterprising ensembles of its kind. With the enrichment of communities through music as Decoda’s core mission, Ms. Sullivan has lead Decoda-style outreach projects in places ranging from Blue Hill, Maine, to Bloemfontein, South Africa, was the leader and author of interactive family performances in Japan’s Suntory Hall, and has curated multi-media chamber music performances at the Metropolitan Museum of Art titled “Line and Expression” and “Musical Portraits.” Most recently, Ms. Sullivan led and coordinated a Decoda residency at Buffalo String Works, working with music students from immigrant and refugee families that have relocated to Buffalo, NY. Other Decoda initiatives that Ms. Sullivan has participated in include song-writing projects for NYPD officers in collaboration with teenagers in the Police Athletic League program, as well as for inmates at the Lee Correctional Institute in South Carolina, which was praised in an Op-Ed piece for the Washington Post. Additional Decoda activities include teaching residencies in Merida, Mexico, the Royal Conservatoire of Scotland, and the Guildhall School of Music and Drama in London, giving interactive performances at elementary schools across the greater Las Vegas area, as well as Decoda Cello Quartet main stage performances and school visits in Maine, Tennessee, and South Carolina. As a member of The Knights, a NYC-based chamber orchestra focused on innovative programming and reenergizing the concert experience, Ms. Sullivan has been performing extensively with the group since 2010. Nominated for a Grammy award in 2017, Knights collaborations with special guest artists have included Yo-Yo Ma, Bela Fleck, Gil Shaham, Dawn Upshaw, Susan Graham, and the Mark Morris Dance Group, among many others. Ms. Sullivan has appeared with the Knights throughout the US, the Ravinia Festival, Tanglewood, Caramoor, Skaneateles Festival, as well as in Germany, Austria and France. As a member of the Knights, Ms. Sullivan also participated in the 2018 multi-media production by William Kentridge, The Head And The Load, which has received wide acclaim for performances at the Tate Modern in London, and at the Ruhr Festival in Duisburg, Germany. Traveling to Memphis, TN several times a year, Ms. Sullivan has been a member of the IRIS Orchestra under conductor Michael Stern since 2007, and made her solo debut with the orchestra in 2014 performing Haydn’s Sinfonia Concertante. In addition to her role as both section player and principal cellist for IRIS, Ms. Sullivan has performed chamber music as well as lead educational activities in schools throughout the greater Memphis area. Having premiered and recorded a number of new works, Ms. Sullivan has played the music of Sebastian Currier, Tristan Murail, Georg Frederick Haas, Julia Wolfe, Steve Reich, Philip Glass, Sarah Kirkland Snider, Jonny Greenwood, among many others with New York’s leading contemporary music ensembles. Performances with the acclaimed Argento Chamber Ensemble have included venues such as LACMA in Los Angeles, Columbia’s Miller Theater, the Rodin Museum in Philadelphia and the Austrian Cultural Forum. Ms. Sullivan has recorded with Ensemble Signal, and performed the music of Julia Wolfe in Carnegie Hall. Performances with the Wordless Music Orchestra have included a tour to Australia, playing the music of Max Richter in the Sydney Opera House and the Melbourne Recital Hall. As a guest with Alarm Will Sound, Ms. Sullivan performed in multiple sold out shows with pop singer Bjork, including at the Governor’s Ball in 2015. Past new-music festival appearances have included the Look and Listen Music Festival, Ecstatic Music Festival, Ojai Music Festival, June in Buffalo, Wordless Music Series, and the Composer Portrait series at Miller Theater, Columbia University. Believing in the power of music education and advocacy, Ms. Sullivan has dedicated much of her time to teaching artistry and mentoring. She has been a Teaching Artist for the New York Philharmonic at PS 81 in the Bronx, as well as The Learning Arts, in a program dedicated to bringing concerts and workshops to students throughout the rural Adirondack region of New York. As a member of ClassNotes, Ms. Sullivan has participated in school residencies in New York, New Jersey, and Florida in targeted programs that bridge academic subjects with ideas central to playing chamber music. As a component of her two-year fellowship with Ensemble ACJW, Ms. Sullivan was a Teaching Artist at PS 153 in Harlem, during which time she co-created The MUSIC Exchange (Musically Uniting Students In Correspondence), a mentorship program involving public school music students and orchestral musicians that combined pen-pal letter writing with a culminating side-by-side musical performance. As a cello and chamber music coach, Ms. Sullivan has taught at the Faulkner Chamber Music Festival in Little Rock, AR, Belvoir Terrace Summer Camp for girls, PRIZM Camp in Memphis, TN, ArtsAhimsa Summer Festival, and has been a chamber music substitute coach for the Juilliard Pre-College Division.